All of the lakes in this area are prone to high winds. Stay close to shore and be aware that you may have a strong headwind and large waves on the paddle back. Having a good paddler in the stern is essential during high winds. This is a rough guide to the various areas available to paddlers. A good guidebook and paddling knowledge is essential. These waters are glacial fed and dangerous to swim in for long periods of time. Wedged between Mount Baldy and Heart Mountain alongside HWY 40, 9km South of Trans Canada HWY 1. This is a large 5km long lake exposed to winds. 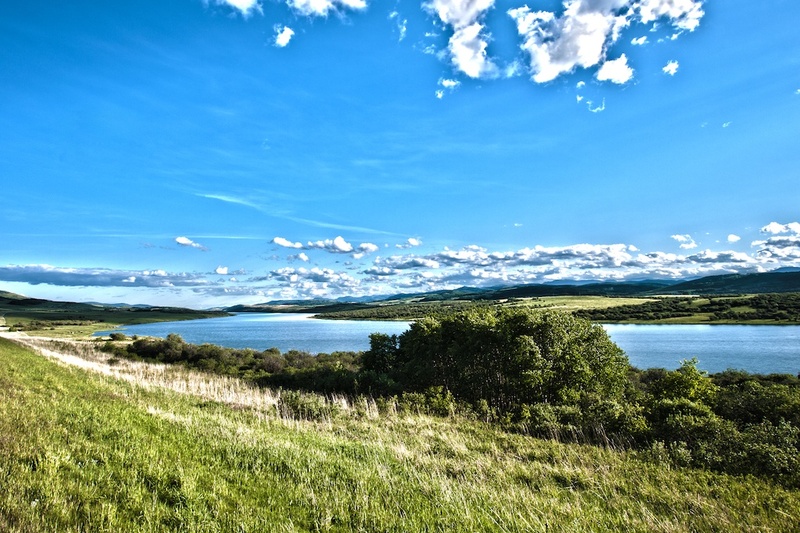 Wildlife and hiking trails surround the lake. Power boats are permitted. To Get Here: From Hwy 1 and Hwy 40 intersection, take Hwy 40 for 11.1km to the Barrier Lake boat launch turnoff on your right. The jewels of Kananaskis, located in the middle of a cathedral of peaks. Pristine streams flowing in and wilderness teaming with wildlife. surround the lakes. Stop for a hike on one of the numerous trails running deep into the wilderness, or do a little fishing. 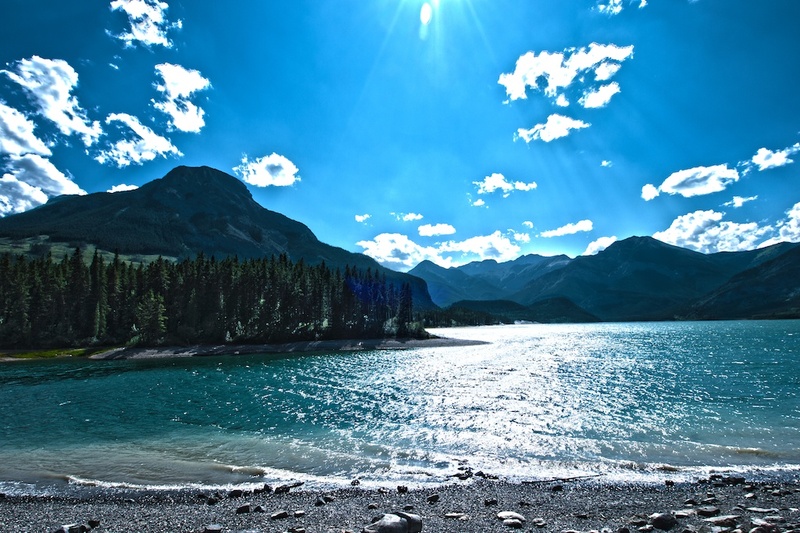 Upper Kananaskis Lake is 3km in Diameter and Lower Kananaskis Lake is over 7km long and 1km wide. Power boats are permitted. To Get Here: From HWY 1 and HWY 40 intersection, head south down HWY 40 for 49.8km to Smith Dorrien Highway. Turn right, westbound down Smith Dorrien Highway and continue for another 2.2km to Kananaskis Lakes Trail on your left. Turn left on Kananaskis Lakes Trail and continue southbound for another 1.7km to the lower lake boat launch on the right or alternatively continue to the end of the road to the Upper Lake boat launch. A very long and narrow lake, over 20km long and around 1km wide. Spray Lakes Reservoir runs beside Smith Dorrien Spray Trail with peaks towering over either side to make your fishing experience that much more enjoyable. Numerous hiking trails surround the lake. Power boats are permitted. To Get Here: From Canmore, take Smith Dorrien Trail for 18.8km to the driftwood boat launch turnoff on your right. A small lake next to the 1a HWY makes for a great easy afternoon float. Bring a rod and test your luck with a variety of fish looking for food below. To Get Here: From the east end of Canmore, take Hwy 1a east for 8km to Gap Lake on your right. Alternate access is available from the east down Hwy 1a. 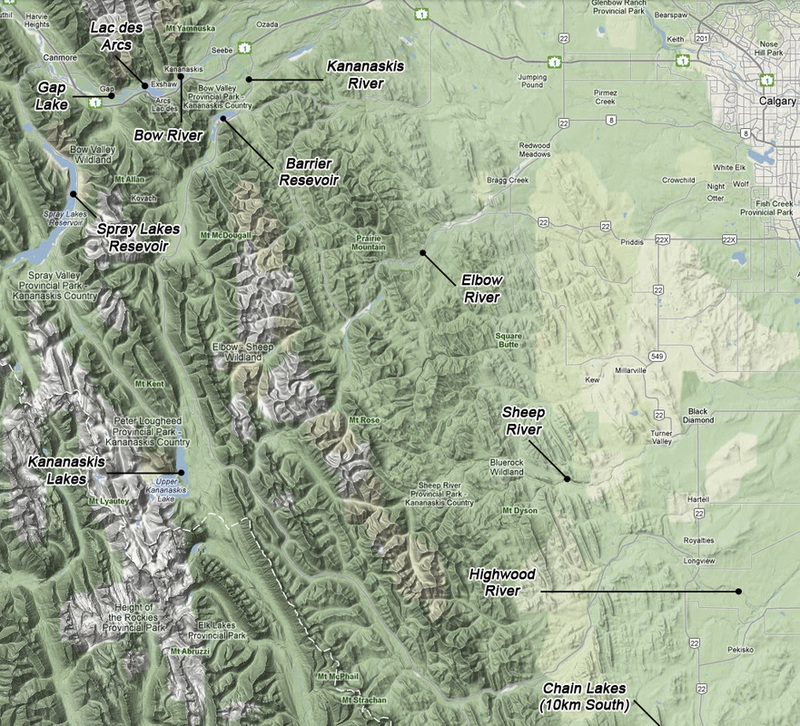 The Bow Valley is a major wildlife corridor and you'll likely see them here. A medium sized lake 1km by 3km, located between HWY 1 & HWY 1a. Enjoy the views or concentrate on fishing. Hand boat launch only. To Get Here: From Canmore, take HWY 1 east from Bow Valley Trail for 16km to Lac Des Arcs turn off. A 10km long narrow lake where you can enjoy those hot summer days floating on the water with a rod dangled behind. Beaches and campgrounds make this area a great summer destination. Power boats permitted but subject to speed restrictions and no towing. To Get Here: From Longview, take HWY 22 south for 39km to Chain Lakes Provincial Park turn off on the right.